Features Mos Def, Cheech Marin and Youth Rap Star Bentley Green! Children today face obstacles and challenges unlike any past generations have seen before – and often more difficult. The pressure on them to make the world a better place is high, so providing them with positive role models to emanate, constructive lessons to learn from and valuable tools to utilize is more important than ever. But so is having fun and valuing the joy of music and the power of the imagination. Luckily, Pacha’s Pajamas is here! The two-CD set Pacha’s Pajamas: A Story Written by Nature Vol. 1 & 2 is inspired by the book by Aaron Ableman and produced by a company called BALANCE. It follows the adventures of Pacha, a little girl whose magical pajamas whisk her away every night to imaginary worlds where she discovers the power to make a difference in the world and within herself. One night while sleeping Pacha dreams that the animals and plants on her new pajamas come alive. Disguised as a small gorilla, she comes upon an unlikely group of creatures feeling sad about the world. Nature unites to tell its captivating story at a global festival where species have come together to bring balance to the planet. Fun-filled acts include an insect band called The Beetles, a black-eyed pea rapping for a better world and a beaver named Just-in-Time. At the end of the show, Pacha shares an important message for all nature and humanity. 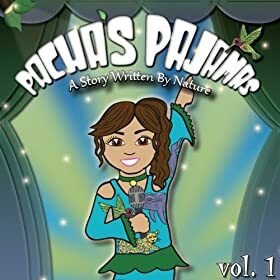 Filled with pop references and lots of humor (“electric eels went on strike”), storytelling, songs and dance, Pacha’s Pajamas features 28 tracks by 70 artists spanning four generations, and inspires children of all ages to better understand themselves, recognize their natural talents and make a positive impact in the world. Pacha’s Pajamas Vol. 1 had a limited release last year for award consideration only and won the People’s Choice for Best Children’s Music in the 12th Annual Independent Music Awards and a Parents’ Choice Recommendation. Featured celebrity artists on the two-CD set include Mos Def, Cheech Marin, Les Nubians, Talib Kweli, Majora Carter, Lester Chambers, the Agape Youth Choir and Lyrics Born. The album also includes rising kid stars Bentley Green (9 million+ YouTube hits), Lil Jaxe, Ta’kaiya Blaney, Amanda Raya, Felecity, Milo McFly, Jaheem, MC Fireworks and Devyn Tyson. Luminaries Bill McKibben, founder of 350.org; Rev. Michael Bernard Beckwith, author and leader of the Agape International Spiritual Center; and 12 year old environmental leader Avalon Theisen, star of the The Autism Channel's new series Nature Tracks with Avalon, are also featured. Song tracks – which covers a wide range of global social, environmental, health and other issues – include Magical Pajamas (asthma), Into the Dream (plastic pollution), Occupy Pacha Jamma (intergenerational justice), Horses Don’t See Colors (anti-racism), Jungle Work (disaster relief), Frog Talk (amphibian protection), We Are All Connected (oneness), Rock Nation (climate change) and much more. Pacha's Pajamas is also a part of Imagination Heals, a new program that brings award-winning inspirational music and stories to hospitalized children across the United States and soon in Canada. As part o f the initiative, participating hospitals receive donated Pacha’s Pajamas albums, books, and musical performances for patients. The program recently received its pilot sponsorship through a generous donation from A Forever Recovery and Best Drug Rehabilitation. Win It: (1) Pacha’s Pajamas Volume 1 to a lucky winner!